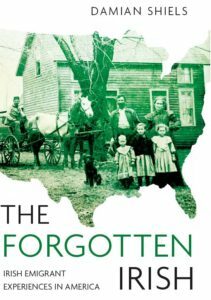 I was recently contacted by historian Ed O’Riordan, who a number of years ago saved a remarkable series of letters sent home to Tipperary by an Irish emigrant in America, William Hickey. The letters chart the story of a young man who experienced the loneliness and uncertainty of life in a new country and his search for a place to settle down. That journey seemed fulfilled eight-years after his arrival, when William arrived in New Orleans, Louisiana. It would ultimately draw to a close near a small Tennessee Church, at a place called Shiloh. I have to inform you that I am in perfect good health as I hope this will find you and my ever dear Mother, brother Thomas, James and my sister Bridget also. My dear father I am not being possess[ed] of as much as take me to go to California which place I am inclined to go with many others which are determined for the same Country where there is the greatest encouragement for young men if I had as much money as would pay my expenses. 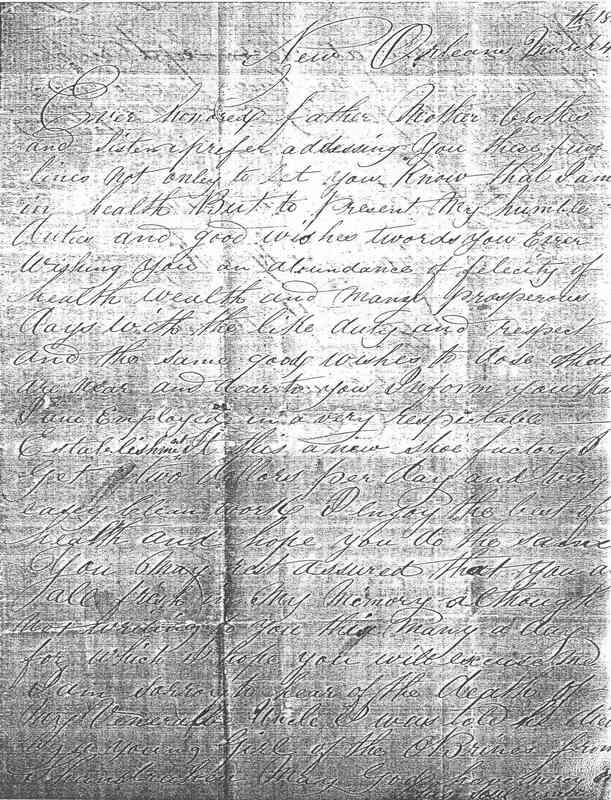 Dear Father it would take 8 weeks to take me there which would cost me 20 pounds which would take a long time to earn it here, everything is so dear and all commodities high through means of the Eastern War [Crimean War]. My dear Father and Mother I am much inclined for it. If you would take me into your kind consideration and remit as much money as would take me there. Therefore I will say no more on the subject but leave all to yourselves. So if you comply with my request I will kindly receive it with many thanks, Etc. …Dear Father we had Tom Russell with Wm. Starkey on board the same ship in good health. Not a single person died on board but one woman who was wife to John Bourke from Tubrid who went to bed with her husband the first night we went on board in Liverpool and was corpse the next morning at 4 o’clock, and left two young children to deplore her loss. He got only two hours to get her away on his back and have her interred. We lost no other person during the whole voyage. [William is here most likely referring to 30-year-old Michael Bourke, who sailed on the Meridian with Mary (9) and Oliver (1)]. We lost no other person during the whole voyage. Wm. Starkey had the title of being Mayor of the ship. My dear Father and Mother I have spent 6 months at the boot and shoe-making, which business is now rather dull here. I have brought Wm. Starkey to Aunt Norry, and Mickey Keatings and received him most kindly. Ever honoured Father and mother, brother and sister. I prefer addressing you these few lines not only to let you know that I am in health, but to present my humble duties and good wishes towards you. Ever wishing you an abundance of felicity and health, wealth and many prosperous days with the like duty and respect and the same good wishes to those that are near and dear to you. Inform you that I am employed in a very respectable Establishment. It is a new shoe factory. I get two dollars per day and very easy clean work. I enjoy the best of health and hope you do the same. You may rest assured that you are all fresh in my memory although not writing to you this many a day, for which I hope you will excuse me. I am sorry to hear of the death of my Venerable Uncle. I was told he died by a young girl of the O’Briens from Shandrahan. May God have mercy on his soul, amen. The man who had left home at the age of sixteen to travel to the United States had come to grief on a Tennessee battlefield at the age of only 25. His letters chart the story of a young boy in search of a better life- a boy who clearly had itchy feet, always looking towards the next place to live, the next opportunity. His journeying around America eventually took him to New Orleans, and ultimately the Confederate army. One can imagine the impact news of his death had at home in Lisfuncheon when it came. The Battle of Shiloh, and the American Civil War as a whole, cast a dark shadow that was often felt half a world away. * I am greatly indebted to Ed O’Riordan who located these letters, which offer a remarkable insight into emigrant life. He also provided me with the transcripts of the letters for use in this post, for which I am most grateful. Thanks are also due to the Hickey family of Lisfuncheon, Clogheen for permission to tell William’s story. Boston Passenger and Crew Lists, 1820-1943. Record for Meridian arrived May 31st 1854. New York Passenger Lists, 1820-1957. Record for Vanguara arrived September 7th 1853. Daniels, Larry 1997. Shiloh: The Battle that Changed the Civil War. Official Records Series 1, Volume 10 (Part 1). 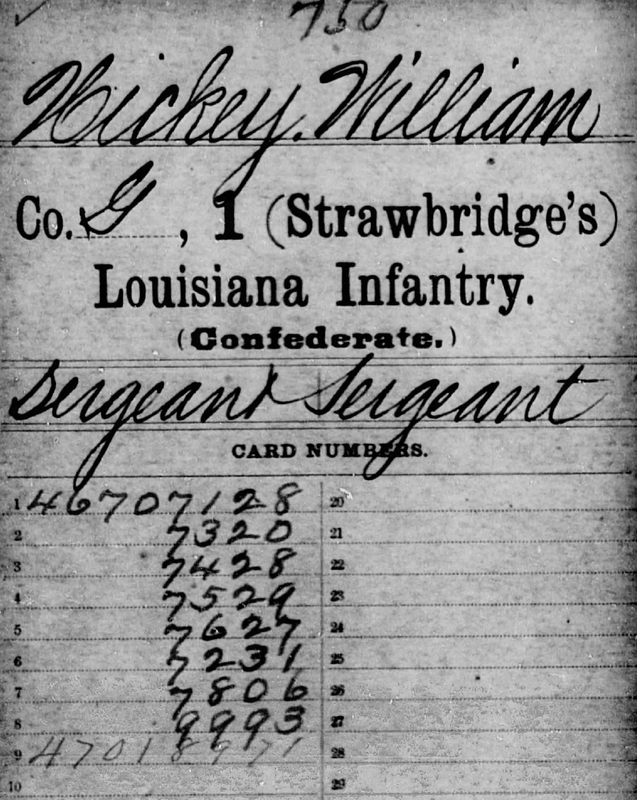 Report of Col. Daniel W. Adams, First Louisiana Infantry, commanding First Brigade pp.536-537. Official Records Series 1, Volume 10 (Part 1). Report of Col. Z.C. Deas, Twenty-second Alabama Infantry, commanding First brigade. pp. 538- 539. Great stuff, Damian. It hightlights how many Irish born soldiers in the war really didn’t have any “dog in the fight” and yet there they were in the middle of it. 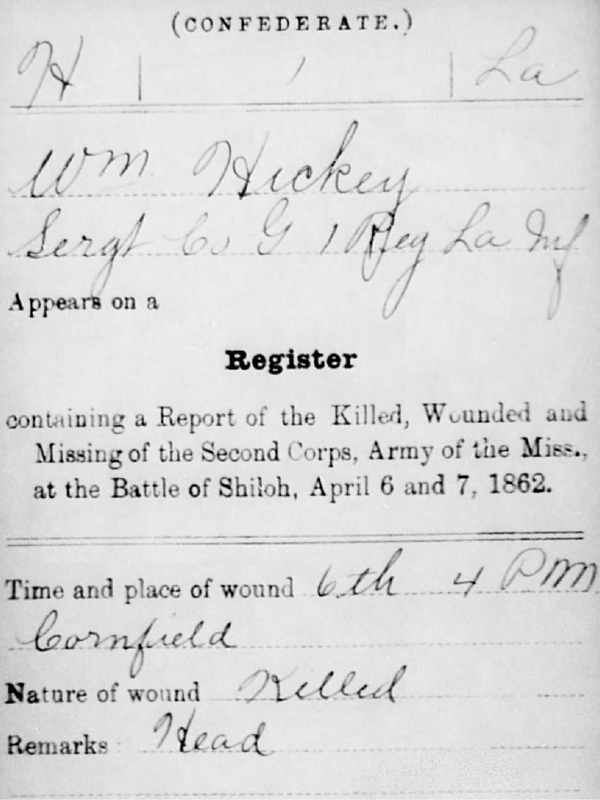 Surely Hickey couldn’t have had much of any feeling of loyalty to “the southern cause,” having barely arrived there. He must have simply been caught up in the enthusiasm and excitement of the those around him in New Orleans when he enlisted. Perhaps after struggling so long to “find his place” in this new land he finally found it in the Confederate Army, short lived as that time would be for him. Thanks Joe- whatever about how committed or not he felt to the fight in 1862, there is no doubt that he could have ended up in any number of locations by 1861 which may well have seen him donning a different coloured uniform. It is all the more sad given his struggles to find somewhere to call his own that he did not live long enough to enjoy it.